82045's frames are pictured here on 22nd July. Painting is almost complete, though progress has been held up slightly by the need for the team to dodge the heavy summer showers. Also on site is the chimney from Riddles Class 3 mogul 77014, acquired from John Besley in 2003. This is unfortunately cracked and unsuitable for use, but will be useful for pattern-making. It is complete with blower ring, which again will be helpful when this item has to be cast. In the workshops, Tony has made good progress on machining the buffer beam gusset brackets and the brake cylinder support stretcher. The four brackets are now drilled - each has 17 holes - and will shortly be ready for mounting on the frames preparatory to fitting the buffer beams, which are at present stored under cover. The buffers themselves are undergoing refurbishment. 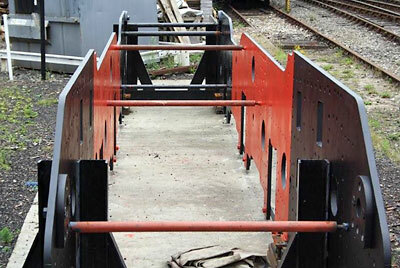 The copper for the inner firebox and firebox tubeplate is expected to arrive during this month. The centre hornblock pattern set is finally complete (phew!). In addition to the pattern itself, there are are 7 coreboxes (for no less than 11 cores) plus an oddside. Although not the most time consuming, this has been the most technically challenging pattern for 82045 to date. 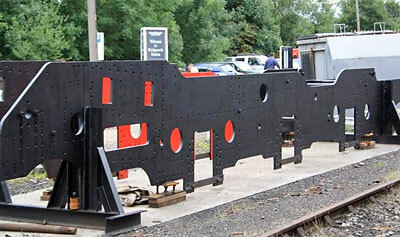 Bridgnorth pattern maker Brian Oldford muses: "Interestingly, the fore and hind driven axlebox guides on 75069 are identical to those on 82045 yet the driver hornblocks are quite different. What is most strange I can see no reason why they couldn't stick with the same design throughout. Also, now the boiler's removed from 75069, the family resemblance shows very clearly on the stretcher that supports both the steam brake cylinder and the boiler's foundation ring." The frames are just awaiting top coat - as soon as time and the weather allows. 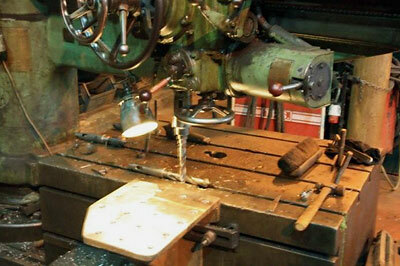 Machining the buffer beam gusset brackets. All 4 brackets have now been drilled on the face that attaches to the frames. Four of the 7 coreboxes from the centre hornblock pattern set. A photo of main part of this complex pattern, under construction, appeared on our May update.